The New Jersey awning company is Patio Shades Retractable Awnings of Bridgewater, NJ, with the complete selection of customized motorized and hand-cranked awnings, arbors, window and door shades, pergolas and other attractive, useful coverings for the enjoyment and protection of your guests, visitors or customers in your home, office or store. Throughout New Jersey, storefronts, homes and industrial complexes are making Patio Shades Awnings their trusted local company for providing hand-crafted, custom-built, highest-quality awnings and related window and door shade solutions, attracting neighbors, clients, and family to retirement homes, warehouses and backyards. Call us at 908-259-4969 (or toll-free at 1-844-NU-PATIO) to telephonically reach our Central New Jersey company office and discuss the awnings you saw on PatioShadesRetractableAwnings.com. With the aid of our on-line Awnings Architect, you’ll see that the full range of colors are available, as is any style from old-world to modern chic, at whether measurements you require, performing whatever function you demand. What makes Patio Shades Retractable Awnings uniquely different from the competition is our close relationship with the world’s finest arbor and awning manufacturers, who happen to fabricate their ultra-fine products in Italy from the most tested fabrics and materials, and we ship those exquisite pieces – all custom-cut to your order – to the good old United States of America for final assembly by hard-working, experienced hands. Then your awning order is delivered to your door, ready for your install above your preferred window or entryway – whatever orifice in your edifice you want to keep the light out of. It’s all for the protection of the kids at home, or the workers and customers who frequent your business. Check out the on-line video, right from inside the graphic rotator on the homepage (main, index, front, first, whatever, you know, that page) of this website PatioShadesAwnings.com, and you’ll see up close how your awning gets designed, manufactured, constructed and delivered to and for you. 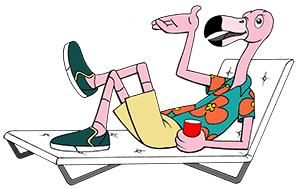 If you need assistance in measuring and obtaining the correct figures for the dimensions of your awning, consult with our own big bird, the on-line character Frank the Flamingo. He tells you how to get the right measurements so that we know how to instruct our manufacturers to create and design it for you. Later, when it comes time to install the product, you can either do it yourself or you can contact us at our Bridgewater location at 908-259-4969 and we can render aid by putting you in direct contact with a nearby expert installer who can bring your new awning into splendid fruition. So another separator about PatioShades Retractable Awnings as a New Jersey company is that we stand with you, our valued customer, through every step of the procedure of selecting, measuring, purchasing, manufacturing, shipping, constructing, delivering, installing and using your beautiful new awning. For an improved quality of life for yourself and your family, for a better, more fun experience for your guests, for a more inviting shopping place for your customers and a more safe workplace for your employees, for your home, for your office, for your business or storefront or warehouse entrance, for protection from the ultraviolet of the sun and the soaking of the rain, your New Jersey awning company is Patio Shades Retractable Awnings (PatioShadesAwnings.com): Hand-Crafted, Above The Rest™.